Contributed PhotoSolid Anchor Baptist Church, 2901 Taylor St., will host an installation service on Sunday for its new pastor, the Rev. Allen Lee Sr., left. The Rev. 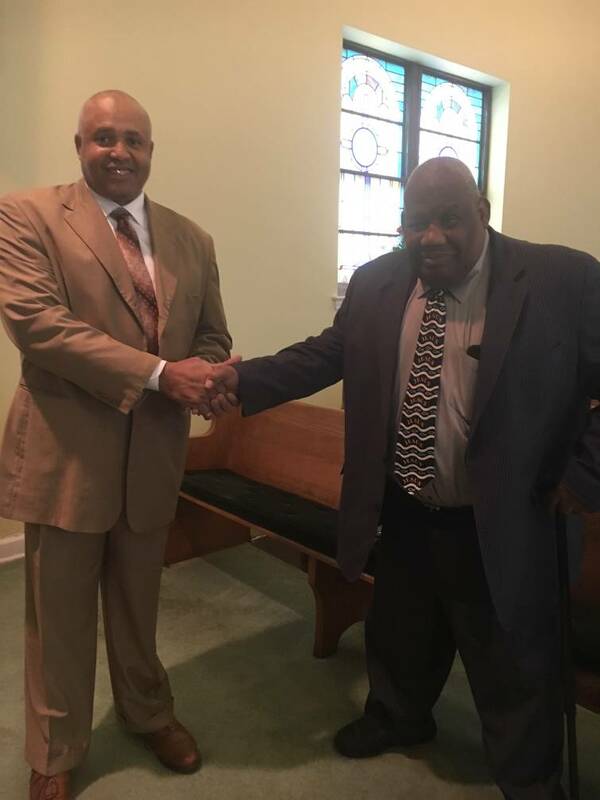 Johnny Horne, right, pastor emeritus of Solid Anchor, will speak at noon, and the Rev. Reginald Poindexter will be the guest speaker at 4 p.m. A reception will follow the 4 p.m. service. Lee has served as youth pastor at Solid Anchor, assistant pastor at Saints Temple Church and associate minister/youth leader at Greater Friendship Missionary Baptist Church. He and wife DeLois Jackson Lee have five adult children and six grandchildren. For more information, contact Chrystal Horne at 423-266-3320 or cyhorne@comcast.net. -Live recording: The Hullender Family records a live CD, with guest emcee Ken Hicks, 6 p.m. today at McFarland Hill Baptist Church, 307 Brickyard Road in Dalton, Ga. jeffhullender@hotmail.com. -'Voice' vocalist: Brooke Simpson, who placed third on Season 13 of the NBC singing competition "The Voice, will be at Metro Tab Church, 2101 W. Shepherd Road, at 10:30 a.m. Sunday. www.metrotab.net. -Fox Family Quartet: Southern gospel group sings at 11 a.m. service Sunday at Signal Mountain Church of God, 517 Timberlinks Drive. Lunch follows. 423-267-0837. -U-Church: "Come to the Table: An Evening of Worship," a student-led community worship service, is 7:30 p.m. Sunday in the Conn Center at Lee University in Cleveland, Tenn. Doors open at 6:30 p.m. Seating is first-come, first-served. 423-614-8347. -Paul Byrom: The Irish tenor of Celtic Thunder fame stops at Red Bank Presbyterian Church, 115 Morrison Springs Road, on his "10 Years On" U.S. tour at 7:30 p.m. Tuesday. $35 general admission, $45 with post-show meet-and-greet. 423-870-4864, http://paulbyrom.ie/index.php (click on News & Events for concert listings). -Lenten concert: The Roueche Chorale and Orchestra will present "Colors of Grace" by Joseph Martin at 7 p.m. March 27 at Brainerd United Methodist Church, 4315 Brainerd Road. Free admission. 423-855-2981, www.therouechechorale.org. -Chattanooga Aglow Lighthouse: President Genendal Fratantuono will be guest speaker for an Aglow meeting at 10 a.m. today at Mighty Warriors Church, 7510 Lee Highway. She'll give her final message before returning to her home state of Mississippi. 423-698-1764, 423-697-9866. -Brake Check: Volunteers from the Scenic City Angel Program of Metropolitan Ministries will repair brake lights for free 11 a.m.-4 p.m. today in the AutoZone parking lot at 2021 E. Third St. The effort by the community ministry is to help citizens avoid police stops that can result in expensive tickets, court appearances and loss of reliable transportation. Supplies are free, and trained technicians will handle repairs. Appointments are not necessary. -Plant-Based Cooking School: Battlefield Community Seventh-day Adventist Church, 96 Hillman Lane, Ringgold, Ga., offers a free, plant-based cooking seminar 6-8:30 p.m. Tuesday. Participants will be able to taste food prepared by the health ministries staff and share recipes in efforts to reverse Type 2 diabetes, lower blood pressure and lose weight. 706-463-1415, www.battlefieldadventist.org. -Young at Heart Game Day: Bring a favorite board game or card game for YAH Game Day, 10:30 a.m.-1 p.m. Thursday at Burks United Methodist Church, 6433 Hixson Pike. Also bring a potluck dish based on your last name — A-G, soup; H-M, salad; N-S, bread or rolls; T-Z, dessert — plus the recipe to be included in a YAH cookbook. -Networking luncheon: Reservations are due by noon Tuesday for the Scenic City Women's Network Marketplace Luncheon at noon Thursday at the Mountain City Club, 729 Chestnut St. Networking will start at 11:30 a.m. Featured speaker is Kay Horner, executive director of Awakening America Alliance and The Helper Connection and national coordinator for the Cry Out America Prayer Initiative. Cost is $20. www.scwn.org, 423-698-6262. -Bible Conference: The fifth annual event, March 23-25, at Bible Baptist Church, 1966 Northpoint Blvd. in Hixson, features Dr. Steven Maldoff as guest speaker and missionaries Thomas Harmon from Tanzania and Mark Harmon from the Middle East. Programs start at 7 p.m. Friday and Saturday, 10 a.m. and 6 p.m. Sunday. www.bbchixson.org. -Breathe: A Prayer Retreat for Men: Designed to give men (18 and older) an opportunity for spiritual rest and renewal through guided and individual times of prayer, 8:30 a.m.-noon March 24 at Chattanooga House of Prayer, 3912 Dayton Blvd., Suite 200, Red Bank. $15; includes breakfast. To register, visit www.chatthop.org/events-calendar. -Catholic Women's Convention: Early bird registration ends today for the Knoxville Diocesan Council of Catholic Women's April 12-14 convention at Chattanooga's St. Stephen Catholic Church, 7111 Lee Highway. For more information, go to www.kdccw.org or call Arlene Webb at 423-598-2977. -Siskin Museum of Religious Artifacts: Open 9 a.m.-4 p.m. Monday-Friday at Siskin Children's Institute, 1101 Carter St. The facility is home to more than 400 religious pieces (247 Judaic and 140 Christian), ranging from the 16th to 20th century. Other religions and philosophies represented include Islam, Buddhism, Hinduism and Confucianism. 423-648-1700, www.siskin.org. -Kidz on the Rock: Groups for kids in kindergarten through sixth grade meet at 10:45 a.m. and 6 p.m. Sundays as well as 6:30 p.m. Wednesdays at White Oak Baptist Church, 301 Memorial Drive in Red Bank. -Awana Clubs: Groups for children age 3 through sixth grade meet 6-7:30 p.m. Wednesdays at Hickory Valley Baptist Church, 2320 Hickory Valley Road. 423-892-1916. -Exercise class: Northside Presbyterian Church, 923 Mississippi Ave., offers an exercise class focusing on strength, energy and balance 10:30-11:30 a.m. each Tuesday and Thursday. Open to all ages and skill levels. $5 per class. 423-266-1766. -Recovery, a Christ-centered 12-step program for anyone struggling with addictive issues, compulsive behaviors, loss and life challenges, meets each Thursday at Ooltewah United Methodist Church, 6131 Relocation Way. Dinner at 5:30 p.m., worship at 6:15 p.m., open share groups at 7:30 p.m. Child care provided. 423-238-9216, oumclive.org/recovery. -Brainerd Celebrate Recovery, a 12-step Christ-centered recovery ministry that focuses on healing hurts, habits and addictions, meets every Thursday at Brainerd Baptist Church's East Ridge campus, 1203 Blocker Lane. Dinner at 5:45 p.m., large group at 6:45 and small/open share groups following. Child care provided. 423-313-8888, brainerdbaptist.org/celebrate-recovery. -Grief support: 5 p.m. every first Tuesday at Fort Oglethorpe United Methodist Church, 1733 Battlefield Parkway, Fort Oglethorpe, Ga. Presented by PruittHealth Hospice. Free. For more information, call 706-602-9546. -Not Alone, a support group for family and friends of a loved one who is incarcerated, meets at 11 a.m. the fourth Saturday of each month at LaFayette Presbyterian Church, 107 N. Main St., LaFayette, Ga. Refreshments and child care are provided. -SonRise Resurrection Pageant: Free tickets for this annual pageant portraying Christ's last days will be distributed at 7 a.m. Monday near the food court at Hamilton Place. Typically, all 7,000 tickets are given away within 90 minutes. The 1-mile, handicap-accessible walk-through event re-creates six interactive scenes from the Bible with 500 costumed cast members, live animals and dramatic sets. The event will be presented by Southern Adventist University and Collegedale Church of Seventh-day Adventists on March 31, with groups departing at 8:30 a.m., then every half hour until 2:30 p.m. Tickets are free, but are required for everyone 7 and older. No more than seven tickets will be given to any family, regardless of the church or group they represent. The person picking up tickets must be at least 16 years old. For more information, call 423-396-2134. -Burks United Methodist Church, 6433 Hixson Pike. Easter egg hunt, 11 a.m.-noon March 24 for three age groups. Preceded at 10 a.m. by games, crafts, light snacks and devotional on the true meaning of Easter. -Union Fork Baptist Church, 350 Lee Pike in Soddy-Daisy. Easter egg hunt, with lunch served, 11 a.m.-1 p.m. March 24 (rain date March 31). There are 16 prize eggs, and every child will go home with something. Contact: 68goldrush@comcast.net. -Middle Cross Baptist Church, 4009 Norcross Road, Hixson. Free Spring Event, 5:30-7:30 p.m. March 24, includes an egg hunt (bring your own basket), music, finger foods and Doodlin' Daphne's Facepainting. 423-877-5742, http://themiddlecrossbaptistchurch.net. -Anglican Church of the Redeemer, 104 McBrien Road. March 25: Palm Sunday, 10:30 a.m. service only; includes blessing and procession of palms and dramatic reading of the trial and crucifixion of Jesus. March 26: Matins, 7:30 a.m. (earlier time), Holy Week readings. March 27: 7:30 a.m. Holy Week readings. March 28: 7:30 a.m. Holy Communion. March 29: Maundy Thursday, Matins, 7:30 a.m.; Holy Communion with foot-washing and stripping of the alter, 6:30 p.m. March 30: Good Friday, Matins, 7:30 a.m.; church open for worship 11 a.m.-3 p.m., with Stations of the Cross at 11:15 a.m., Good Friday service (read) including procession and voluntary veneration of the big wooden cross, sermon on Jesus' words from the cross, no Communion; special reading and prayers at 2 p.m.; Stations of the Cross at 2:45 p.m.; evening prayer service with reflections on the burial of Christ at 6:30 p.m. March 31: Holy Saturday, Easter vigil service, 7:30 p.m. April 1: Easter Sunday, 10:30 a.m. service only. Easter egg hunt following. No Sunday School or Coffee & Conversation. -Fairview United Methodist Church, 3901 Hamill Road, Hixson. March 25: Easter musical, "Grace Wins," 6 p.m., with refreshments to follow. March 29: Maundy Thursday Communion service, 6 p.m. April 1: Easter celebration worship, 11 a.m.
-Soddy United Methodist Church, 255 Depot St., Soddy-Daisy. Annual Easter egg hunt, with refreshments and prizes, for children fifth-grade and younger, 2-4 p.m. March 31. -St. Francis of Assisi Episcopal Church, 7555 Ooltewah-Georgetown Road, Ooltewah. Easter sunrise service, 6:30 a.m. with breakfast following. Easter service, 10 a.m., with egg hunt following. 423-238-7708, sfaec@comcast.net, www.sfaec.org.